If you are a parent, you will no doubt get a request from a child this holiday season for a new iPhone (or iPod, iPad, etc.). When this happens there is always the thought, as a parent, of what to do about safety and monitoring. Now, if you have a 13-year-old or older, you will definitely want to involve them in the process I’m outlining here so they know that they have a say in how boundaries are set up. For those of us that have younger kids, we need to use this as an opportunity to begin creating good technology-related boundaries. For this post, I’m going to specifically discuss settings and tools related to iOS 10 (the software on Apple products). That being true, the principles will apply to other operating systems such as the Windows Phone and Android, but the process will look different. The goal here is to set up and use settings and built-in options that help keep kids safe and monitor their use. This monitoring is not to look over their shoulder, but so that you can have helpful conversations about how to use technology as a tool rather than it becoming a distraction that keeps us from accomplishing the important things in life. The truth is technology has contributed to some amazing things being discovered or accomplished, but it has also contributed to some negative effects on people that could have a lasting impact. 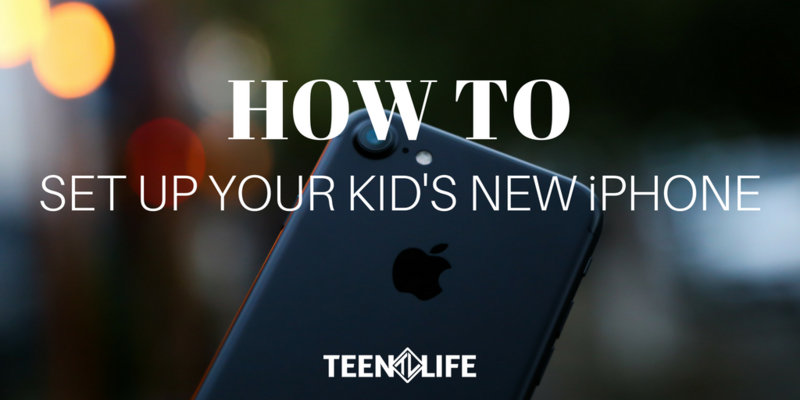 With that as the background, let’s walk through some things you want to be aware of and others you need to set up when you first get a new iDevice so that you are setting your child up for success! In iOS 10 for iPad, iPhone and iPod touch, it is easy to mute the device using the “do not disturb” button. This is enabled by simply swiping up from the bottom of the screen and selecting the button with the half-moon on it. I think this is the most under-used setting in iOS. You don’t have to only use it during funerals, you can also use it during dinner or homework so the phone doesn’t even go off. It is great for keeping those annoying alerts from interrupting chore time or story time in the evenings. Trust me, the fact that there is a new coin or they have almost reached the level that unlocks the greatest player ever is not worth how hard it will be to recover their attention when it dings. Use it anytime you don’t want the device making noise. The advantage to using this rather then the airplane mode is that it still allows notifications to get through, it just won’t alert you. In case you are not familiar with this feature, watch this YouTube video to learn more. I don’t know where the idea came from that kids need privacy and space, but it is mostly wrong. Yes, hopefully they gain more responsibility as they get older, but privacy is only a way for them to hide things that you as a parent probably need to be talking to them about. They can have privacy when they move out and you have invested 18 years teaching them how to make the good choices and they are now in complete control of choosing on their own (and I am overstating this for emphasis, obviously there are times when appropriate privacy is okay, but that’s not the point here). So setting a password, or better yet a finger print, is a must. I would recommend changing the password occasionally, too. Just to keep them honest. This serves two purposes, #1: That they do not have unrestricted access to the device and just use it whenever they want and #2: That they do not have unrestricted access to the device. Okay, so those two are really one, but I hope you get the point. Unrestricted access for anyone that doesn’t have a monthly income and pay their own rent or mortgage is not okay because they are still learning the life lessons they need to have that unrestricted access. One of the settings you definitely want turned on as a parent is automatic downloads. Inevitably, your kids will download something without you knowing. No, it is not certain that they will need your password (or that they won’t somehow find it out). So if you enable auto download on your device, you’ll know everything that’s downloaded on any device connected to your account. This is a simple and easy way to keep tabs on what apps kids are using. You should never have to say, “I don’t really know what app they use with their friends,” because if you have this enabled, you can ask them about it when it gets downloaded. Once you have had the conversation with them, you can simply delete it from your device. Unless of course you want to play the game too! Turning on restrictions is a good plan for you and your kids. Of course as an adult, I can download whatever I want and visit any site I feel like but there may be a time where it’s good for me to pause and consider whether the content on that app or site is really worth my time. This is a great lesson for kids to learn. It may mean a little bit of a headache (sometimes it does for me) if the restriction is too restrictive. But the benefit of forcing a conversation with your child that you should be having anyway is worth the few extra minutes each week or month it will take you to punch in an extra password to allow things that didn’t need to be restricted. If you are unfamiliar with how to get to any of the settings I talked about in this post, do what I do. Search on YouTube and find a video that walks you through the process step by step. I hope these settings and features help you and you kids have some healthy conversations around technology use. In addition, I hope they help set up needed boundaries for you and your kids so that the technology is not in control but still available as a tool and a little fun now and then too. So, what do you think? How have you set boundaries for your students and how have they responded? How have you failed at this and done better? Let us know!